The B vitamins are used to metabolize carbohydrates. And C vitamins are consumed by carbohydrates. Now, so basically diets work by restricting carbohydrates one way or another. And diets fail. Number one, calorie-restricted diets fail because they make you feel miserable. You have that pit in your stomach, you’re hungry all the time. There’s a guy who did some starvation studies on conscientious objectors duriing, I believe, the Vietnam war. And so he said, “You guys are objectors so you can participate in my study instead of going into the service” or whatever, and they said okay. 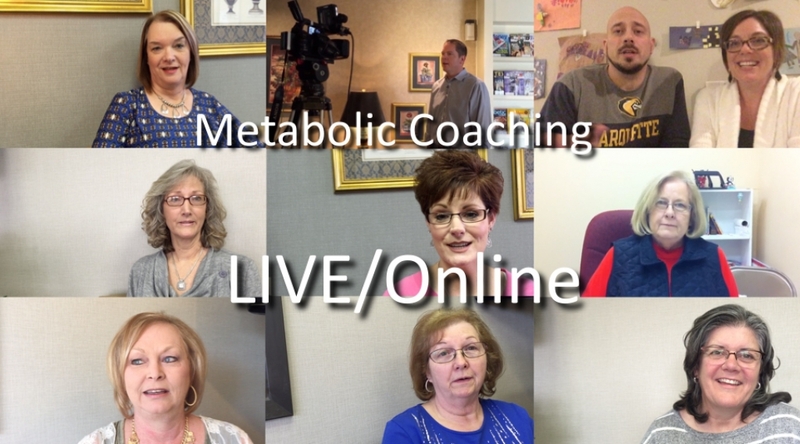 And what he did is he fed them a very low calorie diet, like half the normal amount of calories that you would eat every day, except those calories were things like potatoes and bread. And the people went insane, some of them literally went insane. They went mad because of the hunger. And if you’re on a low-calorie diet and you’re eating carbohydrates, it’s stressful mentally and physically and that’s one reason why they fail. When you’re eating a low-carbohydrate diet, it’s not stressful because you feel full. You eat whenever you want to eat. And you eat as much as you want to eat and as long as you’re not eating carbohydrates, you’re gonna continue to lose weight. Also, diets fail because they fail to address the subconscious mind. And basically we’ll talk about the subconscious in the next hour. 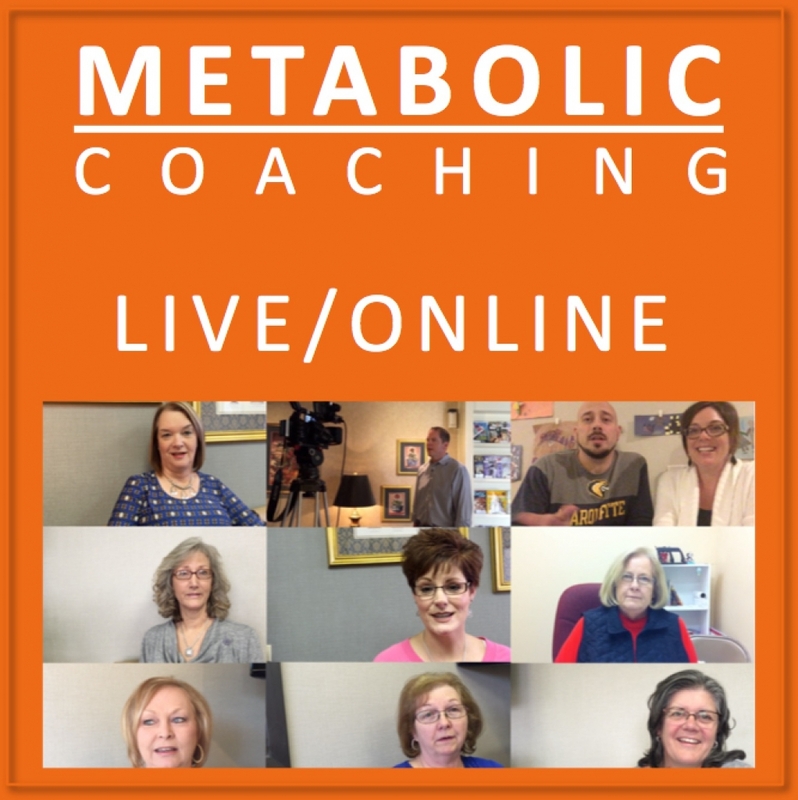 There are a lot of programs that you run inside your mind and these programs determine what you eat, what you don’t eat, what you like to eat, and those need to be addressed and if they’re not addressed, your diet won’t be a success. And so we’re going to address them in this conference. And that’s one reason this conference is so long. This conference is based off of a highly successful Stop Smoking conference given by a guy named Allen Carr. And in his Stop Smoking conference, he does it for 6 hours, 1 day, and he claims to have a 90% success rate. He has published in the medical journals a 50% success rate for his Stop Smoking seminars. And that’s very impressive. That’s something they didn’t teach me in medical school either. Because they teach us in medical school, the success rate of stopping smoking on your own is 5% and you can take drugs and other stuff that double your success rate – so from 5% to 10%. Well, Allen Carr’s seminar has a 50% published success rate and he claims 90%. So that’s why this seminar is a day-long seminar. Part of the things that we discuss is to help you reprogram your subconscious mind and take willpower completely out of the equation. That’s also what the audio CD is – we’ll talk about the audio CD – it’s a series of meditations. It’s not a lecture; there’s four meditations on there that you listen to before you go to bed. Listening to those meditations just reinforces the things that we’ve talked about today. 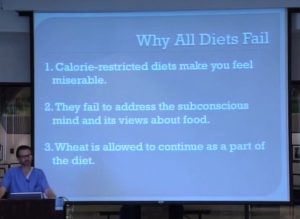 Number three, third reason why diets fail is because wheat is allowed to continue as part of the diet. Wheat has the addictive exorphins in it. And let’s say that you’ve cut the wheat, you’ve cut the carbs, you’ve lost the weight, and then you go, “Maybe I’ll have a bagel.” I wouldn’t do that. I wouldn’t make that mistake because as soon as you have that bagel, the addictive exorphins go back to your brain and then two hours later you’re gonna be going through withdrawal. And when you’re going through withdrawal you’re gonna want another bagel. It’s the same thing as a smoker. Let’s say a smoker quit smoking and he hadn’t had a cigarette in 6 months. Would you tell the smoker, “Well you’re not addicted anymore. It’s okay to have a cigarette”? No. You’d say “Thank God you got those poison sticks out of your life.” Or if you had a heroin addict, a heroin addict that stayed clean for a year. He stayed clean for a year and after a year you tell him, “Maybe you should shoot up a little bit. You’re not addicted anymore, you haven’t had any heroin for a year, you’re not an addict.” No. And that’s the point with the wheat. So the best thing for you to do would be to cut the wheat out of the diet 100% completely. And if you let the wheat back in, that can just cause that addictive spiral to keep going and for your weight to bloom back up; and your blood sugar – your weight, blood sugar, blood pressure. 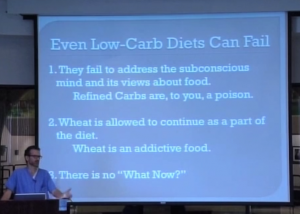 Even low carb diets can fail if they fail to address the subconscious mind. And that’s why we’ll talk about the subconscious in the next hour. It’s the wheat is allowed to continue, and then finally, there’s no “What now?” Let’s say you set your goal weight. Let’s say you decide you want to weigh 172 lbs. and you get there and you celebrate. Then what do you do? Nothing. You don’t change anything. In the Atkins diet books, he talks about, the way that the Atkins diet works is that you cut your carbohydrates down to 20 grams of carbohydrates per day for the first two weeks. That helps you lose the weight quickly. And then you slowly can increase the amount of carbohydrates that you eat. And that’s kind of what I’ve done, but I didn’t do it intentionally and I hadn’t read the Atkins diet book when I did it. But there’s no What Now, I mean, after I got to 172 lbs, did I say “Oh, finally I can have a hamburger with a bun”? No way. I’m not playing with those snakes anymore. 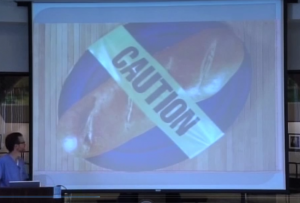 Caution: The things that you thought were harmless are the things that can add the pounds on. In fact, there are people who – this was me, I tell you this was me – I never liked sweets. Sweets weren’t my thing. I only had diet sodas because I thought there’s no sugar in my sodas. But I wasn’t eating sweets, I wasn’t eating sodas, and I got to be 213 lbs. How did that happen? No sweets, no sodas, hardly any sugar, this is what happens: the bread – the things that you think are harmless, and you might even think they’re healthy.